It’s a good thing to alternate masks—especially important if you apply a facial mask every day, as I do. Being happy with my activated charcoal under-eye patches, I decided to opt for a charcoal mask. First, though, let’s ask: What is adsorption versus absorption? We know that when something is absorbed, it sinks below the surface, such as when your skin absorbs moisturizer. The molecules are actually drawn inside your skin. In adsorption, molecules adhere to the surface. Activated charcoal attracts other substances to the surface and holds them there. What does that mean for our skin? Our skin allows absorption of bacteria, chemicals, gases, and liquids—good and bad—into our bodies. But when we use activated charcoal on our skin, especially in the form of a facial mask, it draws those poisons out of the body and into itself, cleansing you from the outside in…quite literally. Activated charcoal can adsorb DDT, lead acetate, and strychnine. It can also absorb drugs like aspirin, cocaine, iodine, and penicillin, as well as inorganic substances like chlorine, lead, and mercury, rendering them harmless. Because of this, activated charcoal is used regularly in hospitals and by other health professionals. Essentially, activated charcoal will drink impurities from your skin. Many online reviews about tea tree oil say it helps within days to treat pimples, and within two to three weeks deals with acne for good. People say it “zaps the zits” and works on all types of blemishes. You’ll find testimonials claiming tea tree oil helps in lightening dark spots, evening skin discolorations, and smoothing skin texture. Others say tea tree oil decreases skin redness and helps with rosacea, scarring, and acne spots. After reading so many exciting testimonials, I was of the impression tea tree oil is a miracle worker. No wonder—it’s a strong antiseptic. It’s known for its powerful antimicrobial properties, which produce soothing effects on the skin irritations and blemishes. That’s why I decided to add it to my Acti-Mask Active Charcoal Facial. Though I strongly believe all these skin issues ultimately must be addressed from the inside, by improving your diet, still I’m thrilled to get all the help I can get from the outside, too. 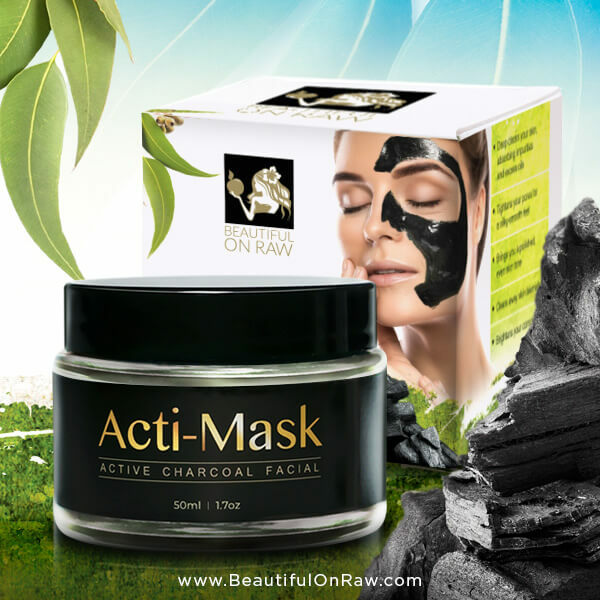 Why Acti-Mask: Active Charcoal Facial with Tea Tree Oil? Real rejuvenation is at hand! Clarify, refresh, and invigorate. Flush out debris, dirt, and those environmental toxins that clog pores and dull your skin, leaving it cleaner, softer, suppler, hydrated, and healthier. Draw out impurities deep within your pores. Banish oil, blackheads, and toxins. Embrace improved elasticity, and younger-looking, younger-feeling skin. This gentle, soothing, activated-charcoal mask restores, improves, and enhances your skin’s texture and appearance. You’ll notice a difference in your skin the very first time you use it. Water (Aqua), Kaolin Clay, Activated Charcoal, Melaleuca Alternifolia (Tea Tree) Oil, Eucalyptus Globulus Leaf Oil, Helianthus Annuus (Sunlfower) Seed Oil* Arctostaphylos Uva Ursi Leaf Extract*, Passiflora Incarnata Extract*, Salix Alba (Willow) Bark Extract*, Gingko Biloba Leaf Extract, Olea Europaea Leaf Extract(Olive) Aspalathus Linearis (Rooibos) Leaf Extract, Camellia Sinesis Leaf Extract (White Tea), Camellia Sinensis Leaf Extract (Green Tea), Glycerin, Anthemis Nobilis (Chamomile) Flower Extract, Rosmarinus Officinalis (Rosemary) Leaf Extract, Aloe Barbadensis Leaf Extract, Saccharum Officinarum (Sugar Cane) Extract, Citrus Limon (Lemon) Fruit Extract, Pyrus Malus (Apple) Fruit Extract, Urtica Dioica (Nettle) Leaf Extract, Melissa Officinalis (Melissa) Leaf Extract, Mentha Piperita (Peppermint) Leaf Extract, Equisetum Arvense (Horsetail) Leaf Extract, Yucca Vera Leaf Extract, Propylene Glycol, Diazolidinyl Urea, Iodopropynyl Butylcarbamate. See my article: Propylene Glycol…Why is it Present in Acti-Mask? Propylene Glycol…Why is it Present in Acti-Mask?